My fellow Americans, our long—and I do mean long—nightmare has passed, and we have peacefully chosen a new cover star for NCAA Football 14, restoring faith in our great democracy and the rule of law. 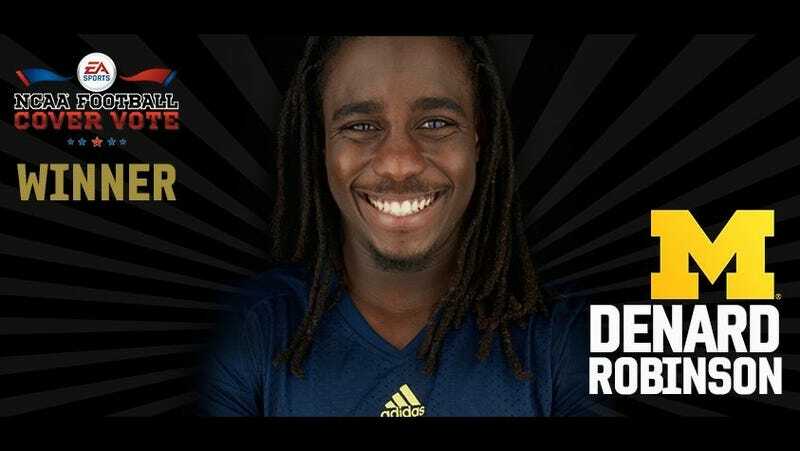 Following a 77-day fan-voted election that actually saw the investigation of voting fraud, Michigan quarterback Denard Robinson has been declared the winner by EA Sports. Robinson joins Charles Woodson (NCAA Football 99) and Desmond Howard (NCAA Football 06) as Michigan Men who have graced the cover. He beat out Texas A&M receiver Ryan Swope in a final balloting conducted by Facebook poll. The final tally was not released. That's probably because, on the original day the cover star was to be announced, Swope made up a 14,000 vote deficit to lead by 1,000 at the last minute. EA Sports, on the game's Facebook page, said it was looking into claims of fraud and suspended the announcement. Since then, North Korea threatened a pre-emptive nuclear strike on the United States and cardinals gathered in Rome to elect a new pope, though these events may not have been related. EA Sports said that, since the campaign began Dec. 16, more than 5 million votes had been cast in it—however, these "votes" also came in the form of Twitter hashtags and Facebook likes in a social media campaign that dragged on over parts of four months.